Divorce, the craving to start my life again, adventure and then finally the opportunity all came together in that order in 2003. With just two suitcases I moved to Chicago in the September. I knew little of the city except for a week I had spent there in the March of that year. I had always wanted to live abroad but so do a lot of people. Doing and wanting are two distinctly different things. I came close to moving to New York in 1997, a move that would have seen me work on one of the top floors of Two World Trade Center. Fate, perhaps, meant that it wasn’t to be. A move to New York was floated again as was Bermuda ironically in 2002 but the job offer, the conviction and the belief, from a man who was to be my boss, was in Chicago and what awaited was my life’s biggest ever adventure. Those early days were pretty tough on my own. I kept a diary, which is now difficult to read. There would be weekly telephone calls with my son, then 3, which would end with me doing a lot of soul searching. However I had a steely resolve and determination to prove myself in my career, and significantly for me, I was desperate to rebuild my life. I will forever be thankful to a handful of friends, who accepted me as someone they had known forever. Without trying, I made them laugh and without trying they gave me their friendship and helped rebuild my confidence. I must also thank my family and my mates back at home for the encouragement they gave, hiding their misgivings. I don’t think they really thought I would last more than a year or two but they weren’t alone, because nor did I.
I initially lived in a non-descript corporate let in a downtown high rise close to the lake. The 8 weeks I was there are a little bit of a blur if I’m honest. Then I moved to an apartment in the leafy yet lively neighbourhood of Lincoln Park. It was my first Chicago winter and there were days when I used to wonder who the hell would live in a place this cold. I used to often wonder why the hell I was living there, but I kept myself busy, in work, and also, more meaningfully by immersing myself into this magnificent city. I was eager after just 6 months to move out of my soulless Lincoln Park apartment, and I made the prodigious decision to move downtown, right on the river. My 34th floor apartment with wrap-around windows soon became home and I quickly realised that the summer’s were as welcoming as the winter’s were freezing. I saved like crazy and then in the spring of 2005 bought an old brick loft apartment in a converted lamp factory downtown in the River North area. I loved it’s high ceilings and character, and I still own it. The apartment gave me some roots and I became and am still a huge advocate for the city of Chicago. I explored every street and neighbourhood, of which their are many sprawled out north, west and south from Lake Michigan, Chicago’s very own ocean. 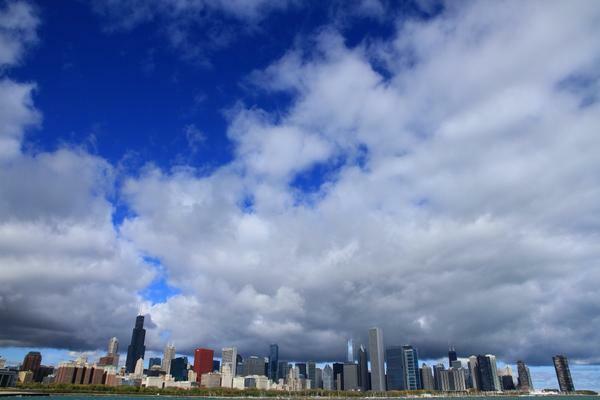 Moving to Chicago gave me the inspiration to begin this blog and I have written prolifically about the city good and bad (I will in time link some of my posts below). I have often described Chicago as America’s biggest secret. It is truly one of the world’s greatest cities. In 2008 after 5 years of being in Chicago we, because by then I had someone to share my life with, reached a little bit of a crossroads. By that time we would have been happy to stay in Chicago forever, but then there was the option to go on an adventure somewhere else. The previous summer my company suggested that I might like to live and work in San Francisco. I wasn’t keen, nothing to do with the location because San Francisco is beautiful, but it was too far from the UK. I turned the chance down but it got me thinking about my future and evidently it got my company thinking about it too and so it transpired that in the summer of 2008 we moved to Bermuda. My heart though is still very much in Chicago….. It’s my kind of town. I have always been amazed at the girth and quality of your web site (how much time do you spend on Rick stuff these day?) and was interested to learn of your Catford origins in a recent response to me. I have checked out your travelogue; it beats most commercial offerings. In particular, I have done a couple of business trips to Chicago and a holiday visit with my wife and if we ever return we will look up some of the districts you provide such good stuff on, as well as checking out your experiences on other places we have been. I finally got around to looking at your ‘About Me'(retirement permits such indulgences) and was flabbergasted to find that Sandhurst School now functions as a petrol station; some time since I have revisited the Torridon Road area. It then suddenly occurred to me that in the heyday of my football career when I appeared for Torridon Rd school and played for Lewisham borough, that we never did play Sandhurst School. Why was that? You didn’t play rugby or chicken out of playing us hardnuts around the corner??!! Keep the posts going, I read most blogs but apart from Ken’s efforts on our CAFCPICKS, yours and NYA make are the best read and most fun. Thank you for you kind comments Mike. Honestly I have no idea how I get time to write the blog either. Something is sacrificed no doubt – reading books, calling friends, decent telly. I don’t know. Fear not, Sandhurst Road is still there and as I understand it’s still going strong. As is Torridon. The school that is now a petrol station is Catford Boys on Brownhill Road. I’ve just come across this bio of yours and am in awe CA. Like you I’ve been following CAFC for a long time and enjoyed blogging in the Frankie Valley days. Shame you weren’t around when we had our legendary bloggers lunch in Legends! Your success in making a career in the US is inspiring. It’s a tough gig. All the best and keep on keeping on. Cheers Rick. Well. Thank you for your kind words Rick.